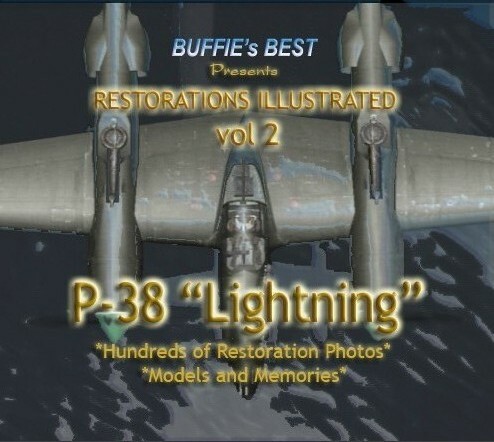 The second volume of the Buffie’s Best Restoration series is everything P-38 and more. For those of you who are not familiar with the Buffie’s Best CDs, they are the best collection of reference photos; both original WWII and modern aircraft are contained in one place. Add to this model photos, restoration photos, photos of every version are included, especially the photo recon and experimental aircraft. This CD is THE essential reference for the P-38 modeler and historian. The CD is broken down into chapters, some examples include WWII propaganda posters featuring the P-38, interviews on recovering aircraft, interviews with combat pilots and their recollections. Upon loading the CD into the CD drive you are treated to a wonderful computer generated P-38 doing a mission. This is followed up with the chapter list. There is so much stuff here there is no way you can view it in one sitting. The amount of information is overwhelming. This is what a reference CD is supposed to be. It is not just a walk around, but it is everything P-38. As an example, the CD even has some photos of the extra tank cars. That is the level of research contained on the CD. Some of the noted features include the top pilots, their aircraft, and their stories. A complete listing of all the surviving P-38s, flyable, non-flyable and those still sitting in the bush to be recovered are included. If you like maintenance manuals and pilots handbooks, this CD contains loads of information, some in PDF format. There are restored instrument panels for every version, including the prototypes. Of course, with a restoration CD you need to have restoration photos. There are plenty. Photos of the Planes of Fame aircraft and Glacier Girl are included. Everything a super detailer could want or possibly need. New to this release is an additional DVD with interviews of P-38 pilots. This is very interesting and each pilot reveals personal stories from WWII. The one that stands out is the pilot who logged co-pilot time in a single seat P-38. I am familiar with a P-51 that landed on the continent but I’ve never heard about a P-38 doing it. The interviews contain very interesting stories and are a nice addition to this CD. If you want a one-stop shop for anything P-38, this is the only reference you will ever need. I can’t tell you enough good things about this wonderful product. If you’ve read this far then you know I loved this CD/DVD. There is so much stuff on this CD that it is almost impossible to tell you everything, so check it out. You will not be disappointed. If you haven’t bought the Bf-109 CD, buy both! I keep the Bf-109 CD loaded in my computer for quick reference when I have questions and now the P-38 CD will be loaded in the other drive. I highly recommend this CD/DVD to anyone, but it is especially great for the modeler. Let me reiterate: This CD is THE essential reference for the P-38 modeler and historian. The CD/DVD can be purchased directly from Buffie’s Best at http://www.buffiesbest.com or by phoning them at 720-200-9122.
Review Text Copyright © 2005 by Floyd S. Werner Jr.